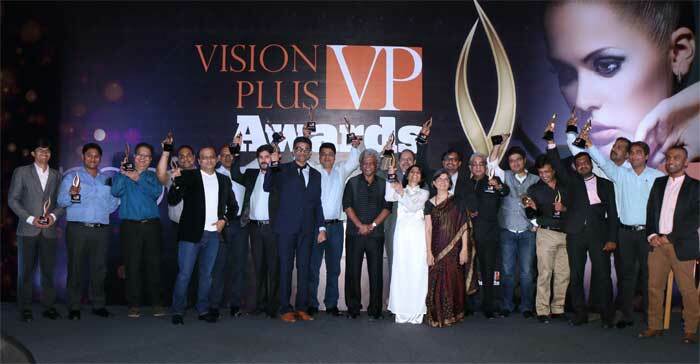 India’s premier eye wear magazine, VisionPlus has added another feather in its cap with an awards show — VP Awards an exclusive event for the optical industry. VP Awards is an effort to honour those who have excelled in the field of vision-care and eye-wear fashion. It all began with an idea to tap into the unexplored potential of the industry and FourPlus Media is working successfully to take the industry to a higher level. The voting process for this novel initiative began on January 1, 2014 and opticians in India got the opportunity to vote for brands that best reflected the tastes of customers. The response was overwhelming. Not only did the dates for voting have to be extended, but ballot forms distributed throughout the industry saw many photocopies added as well! This is the first time that a platform was created for inspiring excellence and the optical fraternity reciprocated by their participation. March 9 , 2014 saw a packed house gather for the inaugural show at the Westin Mumbai Garden City in Goregaon. The who’s-who of the industry, including renowned opticians, distributors, lens and eyewear manufacturers were seen making their way to the beautiful 5 star deluxe hotel for an entertaining and tasteful affair. There was ample entertainment with Nakash Aziz, of Indian Idol fame, belting out his songs from the Bollywood movie, R… Rajkumar. Winners were honoured onstage across categories including Spectacles, Sunglasses, Ophthalmic Lens, Contact Lens and Instruments and Equipment. Best new sunglass collections in Sports, Childrens’ and Fashion were also put up for voting. Brands both global and Indian were brought forward. Special awards were given to Best Optometry or CSR Initiative, Best Optometry Institute, Best Marketing Initiative (Indigenous Brands) and Special Jury Award. But the highlight of the night was the unveiling of Visionaries, a compilation of behind-the-scene biographies of 24 families who’ve pioneered the optical industry. The book was unveiled before the eager crowd by Shri Dhirubhai Daftari, a true living icon of this industry. It took five years’ worth hard work for our CEO Mr Siraj Bolar who says, “The idea for this project began in my mind in the most unexpected way. It was when I had visited a friend, an ophthalmologist by profession, for a consultation regarding a minor eye problem at that time. During the process of testing my eyes, he asked me, ‘… Being so popular in the optical industry, why have you not thought of bringing out a book on the pioneers that spearheaded its formation? …” And that’s how Mr Bolar laid the ground for showing his appreciation for everything the industry has done for him. VP Awards has managed to do just that, and opticians across the industry have welcomed this new endeavour, going by the positive feedback coming in. Click here to view the list of winners. Silhouette: A Summer Fresh Birthday!